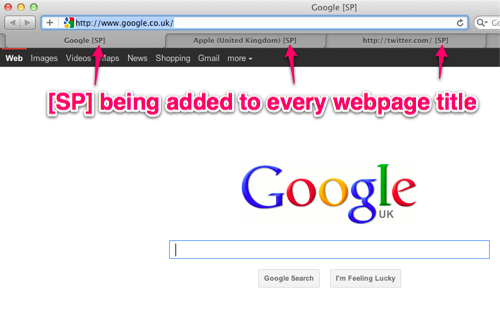 Initially he thought it was just one of his Safari plugins but even after disabling all Safari plugins the [SP] still appears as shown in the screen shot below. 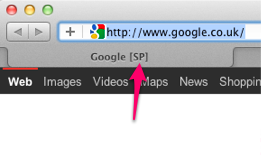 I suggested it could be to show that it’s a Secure Page hence the SP but it shows even on non-https pages and can clearly be seen on the basic vanilla Google homepage in the screenshot above. If anybody is able to help shed any light on this please leave a comment below as he seems to be one of only a handful experiencing this strange problem. UPDATE: Shortly after publishing this post, @benmarsh managed to solve it all on his own…he’d enabled the Debug tools in Safari and unchecked the option to “Use multi-process windows” so the [SP] stood for Single Process. Aha! [SP] refers to Single Process – I remembered I unchecked Debug -> User Multi-process Windows yesterday! D’oh! Solved! Turns out Safari was running in a Single Process Window, to get rid of it check Debug -> Use Multi-process Windows is enabled.